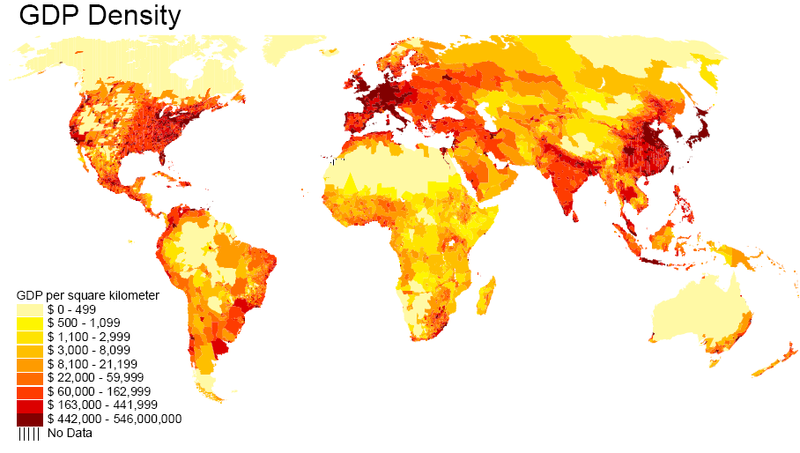 GDP density is a measure of economic activity in a given area, expressed as GDP per square kilometer. Here is the (1999) world GDP density map. Notice the lighter shades in central China & Midwestern USA, in contrast to a darker India. The apparent contradiction is due to relatively higher population density in India; that is, per unit area economic activity is relatively high in most of the India, even though its overall GDP is not. Japan is even darker owing to a high GDP as well as high population density. This implies that GDP density must be dependent on the population density in a given area. But not the entire population in a given area contributes equally to the economic activities of that area; from the following picture it can be inferred that GDP density must be strongly correlated with rich population density of that area. The picture below is a (year 2000) picture of the night sky (the shades are the light emitted). This largely resembles the GDP density graph. This is explained the fact that the darker regions are those either with lower electricity (hence, poorer people), lower population density, or both. Electricity usage, therefore, can be seen as a very good proxy for the economic activity in an area. This also gives the probable implication that large countries like China & the USA show pockets of intense economic activities, as opposed to India – where economic activities is relatively more uniform. Does this call for the creation of dense economic pockets in India too? Manish Sabharwal often talks about the 3 E’s required to build an infrastructure of opportunity in the country (education, employment and employablity). In India, 63.6 percent of the population is of an “employable age” (between 16 and 65). However, not nearly enough of these “employable” people have jobs. At first glance it appears that there is a massive shortage of employment opportunities. A reasonable “next step” then would be for the government to encourage creation of low-skill jobs (e.g. manufacturing) and concurrently improve skill development. The current government is doing exactly that with multiple initiatives including the “Make in India” campaign. However, it may be useful to take a step back and analyse whether employment is the only elephant in the room. Late last year, the then HR minister claimed there is a shortage of 60 million school teachers in India. In addition, as I mentioned in another blog post, Indian police forces almost never meet their recruitment targets. At the other end of the spectrum, IT firms such as Infosys find the need to train their college hires for a good 3 months to make them “employable”. A NASSCOM report even suggested that 75% of engineering students are rejected because they are –not just unemployable– but also un-trainable. A 2012 McKenzie report predicts that we will fall woefully short of medium skilled workers in the near future . So, while job creation is certainly needed, why are so many of our able-bodied men and women “unemployable”? It is interesting that the issue of lack of market ready skills range across the spectrum from low-mid skill jobs to mid-skill jobs and high skilled jobs. So, while we continue to create low-skilled jobs, a larger focus is needed in improving employablity. As argued by Narayan Ramachandran, improvement in vocational training, such as diplomas, can play an important role in changing the situation. In addition – especially in the high-skill sector – an increased emphasis on industry readiness is necessary. Working directly with industry and constantly reviewing and reinventing curriculum is needed. Finally, working towards employability should not stop once an individual is employed. With changing times, the skills required change rapidly. For example, as discovered recently when the UP government decided to make English language mandatory, only 2-3% of government teachers were equipped to teach the language. Constant skill development will not only help the population find employment, but will also assist in keeping them competent. Sandesh Anand and Ankur Pandey are students of the 9th batch of the Graduate Certificate in Public Policy. The views expressed here are the authors’.